This house, designed by one of America's most famous architect, Frank Lloyd Wright is located in Mill Run, Pennsylvania. 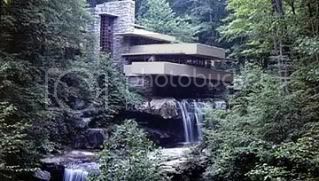 Built between 1936 and 1939 it is so named Fallingwater because it is built atop a 30' waterfall and it does not even appear to sit on solid ground. Oh, I got to tour a couple of Frank Lloyd Wright houses... wouldn't I adore visiting that one? I've imagined homes built with their own waterfall wall... not like that one, though... what a cool idea for story setting.